Black won 16 games and White won 20. We welcomed a new release of Fuego to this event, playing as 'mpfuego'. In round 1, mpfuego lost by a large margin to Orego12. Even an old version of Fuego would have expected to beat Orego, so there was clearly something wrong. Mpfuego lost all its games in the tournament, because it was achieving many fewer playouts than it should have been. Its operator later explained "We are using the Message Passing Interface (MPI) library. If an MPI process stops without cleaning up its messages, it will cause troubles for the following processes. I think that is what happened. Normally that should not happen, but it may have happened with the settings we used for the tournament." In round 2, mpfuego lost to NiceGo19N. After the players both passed, they disgreed about the status of some stones, and entered the "clean-up phase". 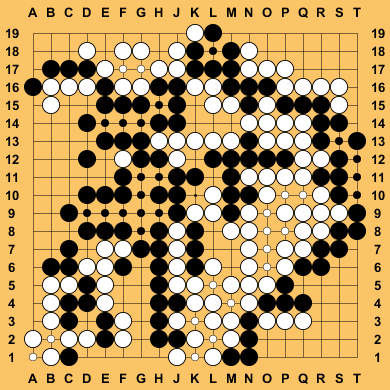 After NiceGo19N had played three stones and mpfuego had passed once and played one stone, they each passed again, ending the clean-up phase in the position shown to the right. This was scored as a win to NiceGo19N; this would have been the result if they had both finished the clean-up phase correctly. My guess is that mpfuego does not handle the game end correctly, and NiceGo19N was happy to have the game end in a position it knew would be counted as a win for it. But I urge the programmers of both to make them handle the clean-up phase correctly. I have seen many won games lost by bots which failed to do the clean-up correctly. 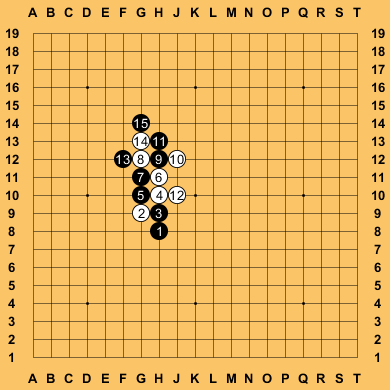 In round 3 the game between Orego12 and NiceGo19N started as shown to the left. This looked odd to me, games betweeen dan-rated players do not start like this. Orego12 then tried to save the stones it had lost in a ladder. Also in round 3, mpfuego's game is listed as a "loss by forfeit". This happened because its operator logged in to its account to resign for it, causing the server to score it as a loss by forfeit. In round 4 mpfuego lost on time (in a lost position). It left itself with two seconds for its final move in the Canadian overtime period, and then failed to make this final move in time. It repeated this behaviour in several subsequent games. The round 7 game between mpfuego and NiceGo19N ended in a similar way to their round 3 game. Both passed when the game was clearly not over, and played only a few moves in the clean-up phase before they both passed again with many regions of the board undecided. Again the game was scored as a win to NiceGo19N, which would also have won if the game had been finished properly. MP-Fuego, running on 512 cores of a 1024 core Intel Xeon CPU E7-8837 @ 2.67GHz. nomiBot, running on one machine with 2 Xeon E5-2680 (total of 16 cores, @ 2.70Ghz with hyperthreading). Orego, running on five nodes of a custom Linux cluster Fido. The node has two AMD Six Core Opteron 2427 2.2 GHz processors (60 cores total), 8 GB RAM, Centos Linux.